Recently I prepared Beef ‘n Mushroom Pie a day ahead and brought it to my aunt’s home, where it was quickly & easily reheated. I served it with ready-made sweet potatoes – sooo good !! I love this pie – it’s like a “meat & potato meal” in a pie. 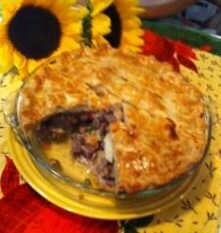 It’s already been a year since I began my blog – and Beef ‘n Mushroom Pie was the first recipe posted! Well, after promising many of you for almost a year that I’d “get moving” and begin posting recipes – I’m FINALLY posting my first one. (I can’t guarantee how well this first blog is gonna come out because I can’t be bothered reading lots of instructions!!) I’ve got zillions of recipes I want to share, and I know many of you have complained that you’re tired of always cooking the same things. So, consider me here to shake up your culinary life!! I made this Beef ‘n Mushroom Pie recently when some friends invited me over for an evening of “pizza and a bonfire”. (And, of course, some “beverages”!) The pie was a big hit!! (It’s a Pillsbury Bake Off winner from about 20 years ago.) I changed the recipe slightly, such as using four cups of potatoes instead of two. With the extra potatoes, you’ll get at least six good-sized yummy portions!! The recipe calls for a pound of left-over roast beef, but, since people don’t prepare roast beef as much as they used 20 years ago, I just buy a one pound “hunk” at the deli counter of my local grocery store. Oh…if you’re wondering how the party went… well, we were in the hot tub at 1:30 a.m.!!! —- Believe me – this pie has so much flavor, with so little effort! 1 lb. cubed COOKED roast beef, about 3 cups ++ Buy a 1 pound “hunk” at the deli counter. In a large skillet, cook cubed beef, chopped peppers & onion in a few tablespoons of olive oil over medium heat for about 3 to 5 minutes. Add the mushroom soup, mushrooms and spices. Mix well. COVER and simmer for 10 minutes. Pour in the hot filling. Now it’s time to add the potatoes, which have been cooked and drained. Just layer them on top of the hot mixture. OK – you’re almost done!! Place the top crust on top of the potatoes. Fold the top crust over the bottom crust and “crimp” the edges of the crust. You can do this with a fork (don’t press too hard or you make the edges to thin) or with you can crimp it with your fingers. Now for the “beauty part” – the part that makes everyone go “Wow, how’d you get your pie to look like that?” Beat an egg in a small glass or bowl, then, using your fingers as a paint brush (use a pastry brush if you want, but you’ll only have to wash it after! ), spread SOME of the beaten egg (you won’t need it all) all over the top crust. ++If you end up with “puddles” of egg wash in some of the grooves, just dab it out with a bit of paper towel. Bake at 375 F – in the center of the oven – for 45 minutes. Enjoy !! ++ If baking the pie ahead of time, allow the cooked Beef ‘n Mushroom Pie to cool for about 25 minutes, then cover with foil & store in refrigerator. ++ To reheat pre-baked pie, remove foil & bake in a 350 F oven for about a half hour. A friend recently if I thought stew meat might be used as an alternative to cooked roast beef. Great job on your new blog!! Great recipe and nice pictures! !